6/55 Reagen Sulewski Simon Pegg is like unto a God. 6/48 Les Winan Destined to be a word-of-mouth cult classic. If not, it should be. One of the most creative and well-written comedies in a long time. 16/126 Kim Hollis Watch this zomromcom. Then import Spaced from Britain and watch that too. If you did a spur-of-the-moment survey to ask a room full of Americans to name their favorite British television comedy ever, you'd probably get answers like Monty Python, Black Adder, The Young Ones, Absolutely Fabulous, and Coupling. All of those answers would be wrong. Little seen in the U.S. other than a few crappily edited episodes that aired on Bravo, Spaced is the true champion. Co-written by and starring the gifted and sardonic Simon Pegg and Jessica Stevenson, the ingenious show applied its biting satire to such wide-ranging subjects as Star Wars fanboys, comic book shops, gun nuts, Resident Evil, Robot Wars, One Flew Over the Cuckoo's Nest and Say Anything. Along with director Edgar Wright, the duo created a show with faultless comic timing and a willingness to go over the line that most shows are reluctant to take. Now Pegg and Wright are re-teaming for a film that expands on the "subtle blend of lateral thinking and extreme violence" expounded upon in Spaced for a comedic take on the zombie disaster flick. With tag lines like, "Bought coffee. Called Mom. Dodged zombies" and "A romantic comedy. 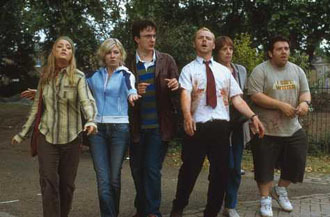 With zombies," Shaun of the Dead is already looking like a can't-miss proposition. The film itself is described as an ordinary story about life and love -- and the living dead. The central story revolves around a group of friends who must deal with a zombie holocaust that has its beginnings at their local pub.